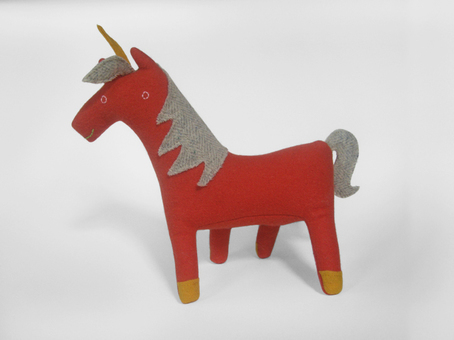 Unicorn no.55 has a bright coral body with a white and grey herringbone mane and tail. It has a little golden horn and hooves. It's quirky face is hand embroidered with light pink eyes and a lime green smile. Unicorn no.55's legs are uniquely positioned so that you can see all four legs at once. It is made out of high quality, woven wool that I've felted, and is stuffed with eco-friendly fiberfill.